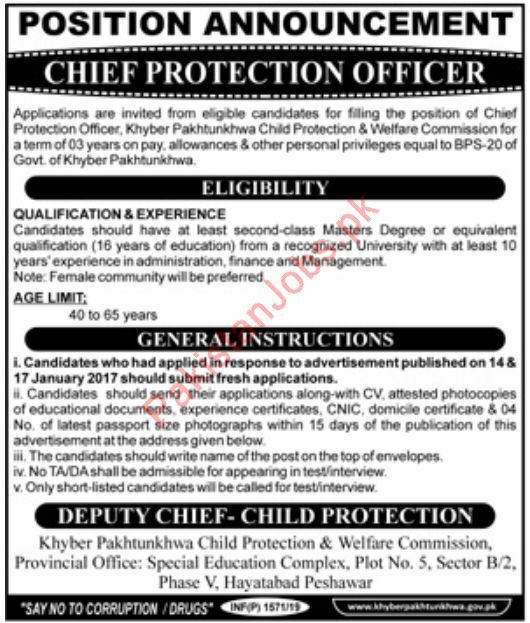 A Well-Known Government Organization Khyber Pakhtunkhwa Child Protection and Welfare Commission needs qualified and expert staff for their organization for the post of Chief Protection Officer with an educational requirement of minimum Master o r 16 years of education. Assalamu-e-Kum. May name Owais Ahmad from Kpk Nowshera. Qualification: B.com Experiences: Ms Lawaghar Constructions Company Accountant officer job 2 years experience. Mecas Engineering Company Computer Operator job 1 year experience.